← Post-garden post: Lettuce, anyone? You’ll have to take my word for it that two days ago it looked quite bright and bushy-tailed in a potato-patchy sort of way. Looking at that patch last week, one could believe that some potatoes, even in this age of slippery values, retained a strong sense of purpose in their potato-hood. Proud to be potatoes, they seemed enthusiastic about this business of producing little potatoes. But now look at it. There were plenty of small pine bits about for mulching, so that part was easy. I thought I’d wait and see if there’s any sign of life from these stems. I’m inclined to leave the plants that sprout new leaves and yank any that just keel over and give up the ghost, to keep them from rotting in the ground. There are potatoes; I checked. Does anyone have any actual information or experience that bears on this denuded potato-stem situation? Relevant moral or work-ethic lectures also welcome. If there is a chance of the foliage coming back that doesn’t mean they are going to flower again does it? We can’t find ANYTHING online about what to do when this happens. If they were just about finished with their lifecycle, then maybe you can get away with digging them up and using them now. Okay… guess none of that was much help… dang it!! Oh my god, Dee, that’s an awful prospect, and it never occurred to me. I think I’ll head out with a trowel this morning. Okay, afternoon. Shibaguyz, thanks for the internet attempt. I couldn’t even think what to enter for search terms! Well, I got out there with a gardening fork, looked at the new growth on the decimated stems, and hadn’t the heart to proceed. Marched back inside and hit the web, which I simply hadn’t had the heart for earlier. 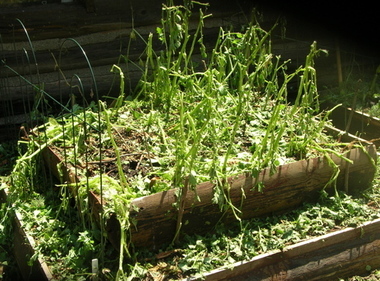 “Potaoes midseason damage” brought up mostly pest-related sites, but at least one mentioned hail. “Potatoes hail damage” gave me a couple of real sites, both discussing recovery after hail, and neither talking about getting the potatoes out of the ground as fast as possible. So, I’m putting the digger away. Wise girl, Kate. If there’s any chance that they’ll resprout and flower, then you’re going to get bigger spuds. If no foliage grows back, it’s best to shear off the stems and leave the spuds in the ground to harden for a couple of weeks. These won’t get any bigger, but will store better than if you dig them up now. So either way – leave them for a bit and see what happens! While I’ve not quite had that kind of hail decimation, I have had my share of collapsed and lazy potatoes. Heavy rains the past two years have smashed them down flat and killed some of the plants. On the truly dead, I dig up the new potatoes. On the collapsed and weary, I have actually staked them up! Works for me. The plants reinvigorate and produce some nice potatoes. That’s a real shame…there’s nothing worse than something we can’t control ruining our hard work and efforts! I’m truly fascinated by it though, they must have been blummin’ big and constant hailstones to cause that must damage. What have you decide to do?